In today’s day and age, you can’t be too careful about who you let into your home or who you get too close to when out shopping at the mall or in another public space. The moment you let your guard down, kidnappings, abductions, and other threats could happen in an instant. Unfortunately, we have been hearing about incidences like these in our own community, and they could happen to anyone. Read through these self-defense tips, for both while you’re at home and when out in public, to lower the chances of an attack. Above all, always be on guard. Even when you’re home, it’s a good idea to keep your doors locked, especially if you live in a remote location where it would be difficult to get help if a dangerous intruder did show up at your door. If you can, use peepholes or windows to see who’s outside before opening your door. If you have no way of checking the doorstep without opening the door, only crack it a few inches if you’re not sure who it is. Your home should be well-lit, both inside and out, but people shouldn’t be able to see inside when it’s dark outside. Get blinds or curtains that will keep anyone from seeing through them and being able to potentially track your movements or know when you’re not home or sleeping. 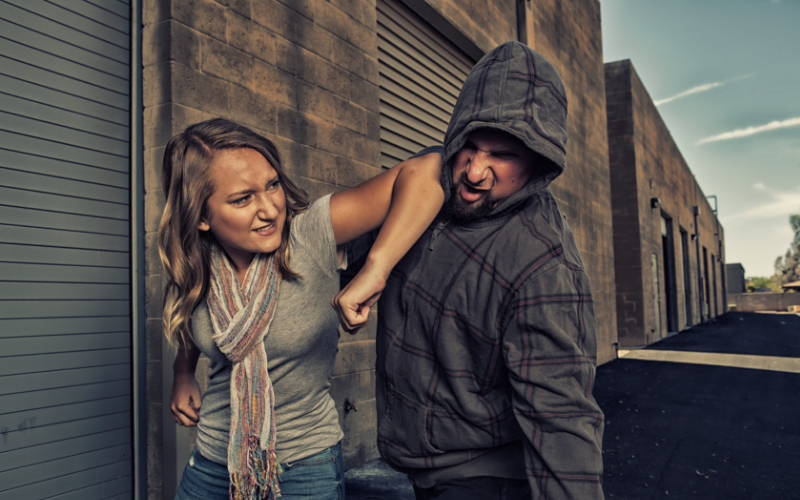 Anyone can benefit from taking a self-defense skills and brushing up on ways to thwart an attacker. These types of classes typically also teach participants how to evade attacks with a gun, knife, or other weapon. The Allegheny-Kiski Health Foundation occasionally hosts a free self-defense class, so be sure to keep an eye on the Events Page. Surveys have shown that having a dog at home can deter burglaries and break-ins. If you don’t already have a furry friend, consider adopting one from one of the many animals shelters in our area. Never let your guard down, even when doing something as seemingly safe and secure as grocery shopping or grabbing a cup of coffee. Abductions and kidnappings can even happen in crowded, public spaces, so always be very aware of what’s going on around you. If you feel like someone is following you, avoid putting yourself in a situation where he or she could easily attack you, and alert security personnel or seek help from others around you. Unless you are able to run away to a well-lit and well-populated area, don’t give up fighting your attacker. Take any and all opportunities to injure your attacker so you can get away. Go for areas like the face, eyes, groin, and knees. If you can’t use your hands to scratch, hit, or punch, use your hips to push your attacker away, then kick with your feet or knees. Self-defense instructors can demonstrate a wide range of moves you can perform to get away from someone who is trying to restrain you. However, even if you forget what you’re “supposed” to do, never stop trying to injure your attacker and get away to a safer location. Mace, also called pepper spray, can be a good safety accessory to carry with you at all times. However, if you are going to carry it, you need to make sure you are comfortable with using it. Practice spraying it at home so you know how far it will spray and how close you need to be to your attacker in order for it to be effective. Always spray downwind so it doesn’t blow back into your face. Aim for the attacker’s face. Spray two or three times before running away. Avoid letting your attacker take the pepper spray from you and use it on you. Carry pepper spray in your hand when you feel you’re in an unsafe environment. If you have to dig through your purse to find it, it’s not going to do any good. If you get a bad feeling about someone when you’re talking with them or even if it feels like someone is walking too close behind you, trust your instincts and remove yourself from the situation. Don’t worry about being perceived as rude or mean. Your safety is much more important.